Everyone is familiar with the bell ringers in front of the stores this time of year. 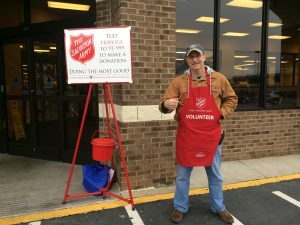 The Salvation Army is a great organization who uses the funds from bell ringing to provide resources and support to those in need. 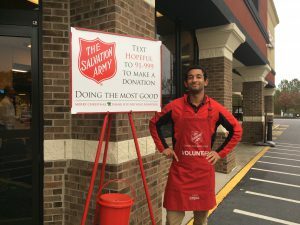 The Salvation Army needs volunteers to ring the bells and every year CallingPost provides volunteers for a bell-ringing location. This year, CallingPost manned a local grocery store location, adopting the whole day. CallingPost’s unique event manager helped our staff organize the times for each bell ringing shift. 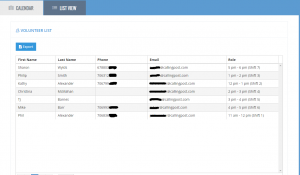 Each member of our team was able to sign up online by picking a time slot that fit their schedule. Once everyone signed up for their selected shifts, the group leader got a list of all the members and what time they signed up for. This eliminated all the hassle of passing around a sign up sheet and trying to remember who signed up for which shift. In addition, the group leader can set reminders for the group so that they can be reminded via phone, text and email about the event date and time. This is a wonderful tool for any group or organization to use. It can be used for events, programs, and even pot-luck dinners.